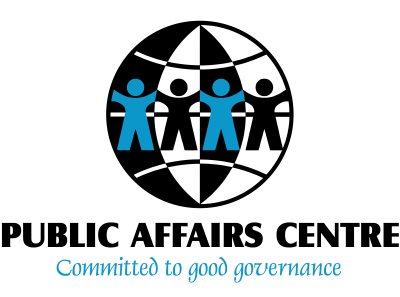 Public Affairs Centre (PAC), is a non-partisan not-for-profit civil society led think tank dedicated to mobilizing demand for good governance in India. PAC focuses primarily in areas where citizens and civil society organizations can play a proactive role in improving governance. PAC's uniqueness lies in synthesizing research and action in its activities and approaches. Its research aims to provide a stimulus for its action and its action, in turn, is powered by knowledge derived from research. PAC's work is primarily organized on the premise that an informed citizenry is the key to improved governance. PAC has pioneered the use of Citizen Report Cards, undertakes public policy research, and channelizes funds to improve accountability in public. PAC developed the internationally-acclaimed Citizen Report Card (CRC), a methodology which systematically collects feedback on service quality from actual users through a sample survey. This approach, with its recent avatar that includes all stakeholders, provides a reliable basis for communities and governments to engage in a dialogue and joint action to improve public service delivery. CRC began as a civil society initiative, it has since been adopted by governments as a cost effective way to monitor services and programs, both in India and other countries. PAC works with a wide range of stakeholders including International donors like DFID,SANEI, ANSA - SAR, Central and State governments, research institutes and other civil society organizations in fulfilling its mission. PAC has been working extensively with the Planning Commission of India and the Karnataka State Planning Board, Expenditure reforms commission, several municipal agencies in the country and has carried out several research and evaluation studies for them which have all fed in to informed decision making. Through its several experiments, PAC has large network of partners across the country in about 8 states. Apart from this PAC also operates in south East Asian countries like Nepal, Sri Lanka and Bangladesh though its partners and affiliates. PAC's considerable links with the national and state governments have provided us enough inroads into policy circles to advance our views on citizen responsiveness and the inclusion of citizen voice in policy design. In addition to the entry points afforded by projects undertaken at the behest of state planning boards (Karnataka, West Bengal, etc) and national agencies (such as HUPA, Planning Commission), PAC also plays an active part in national fora such as Wada Na Todo Abhiyan (realisation of MDG, and post-2015 planning) and Jan Swastha Abhiyan. At the international level too, PAC's work has attracted invitations from UNU-WIDER Helsinki, International Forum for Maternal Health, and the World Forum for Democracy. PAC has affiliations with well known universities in Asia like the National University of Singapore and BRAC University, Bangladesh with whom; we carry out joint research work on good governance and public policy.